GUANGZHOU - Bras and cosmetics have been added to the "traditional" paper offerings of villas, cars and wines for Qingming Festival, or Tomb-Sweeping Day, which falls on Monday. "The 18-yuan ($2.6) bra and a cosmetics set, which costs 28 yuan, are new products this year. The cosmetics set includes foundation, perfume, lipstick, facial cleansing cream, lotion and shampoo," the woman owner of a store on Guangxiao Road told prospective buyers on Thursday. "And no bargaining for the new products," said the owner, who gave only her surname, Peng. She said business at her store has been brisk for the past week and the new products attracted some young buyers. "Just about 30 minutes ago, a young man purchased two bras and a cosmetics set," Peng told China Daily. The man, in his 30s, said he would burn the paper offerings at his wife's tomb on Monday. His wife, who was killed in a traffic accident two years ago, was fashion-conscious, he said. 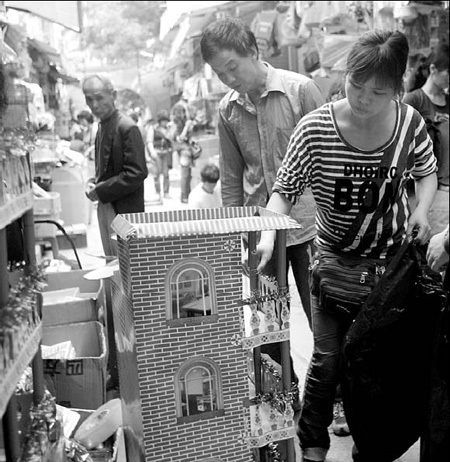 In addition to the traditional items of paper money, the sacrificial articles available in Peng's store include villas, sedan cars, garments, wines, cigarettes, seafood, pianos, violins and other "luxury goods". "I had to diversify the items to meet the growing demand in recent years," she said. But the new sacrificial articles have sparked controversy in the city. Chen Wenzhi, an executive in his 20s, said the new articles would certainly help attract young buyers. "As society progresses, the offerings should also keep pace with the times," Chen told China Daily. But Huang Bolian, a senior citizen, said he would never buy such new offerings to burn for the dead because they were not suitable for mourning ancestors. "We should keep our traditions," Huang said. As the Qingming Festival draws near, business at the city's restaurants and flower shops that sell products for mourning the dead has also begun to pick up strongly. An employee at Guangzhou Restaurant said the number of people who order roasted suckling pigs has witnessed a growth of 10 percent this year due to the low price. A roasted suckling pig is now being sold at about 400 yuan, 100 yuan less than last year. "We lowered the price because the costs have fallen," said the employee, who did not want to be named. The prices of fresh flowers, however, have risen by about 20 percent because of the severe drought that hit Southwest China this year, according to a florist. A bouquet of lilies, chrysanthemums and carnations is going for between 15 and 50 yuan, the owner told China Daily. According to estimates of the Ministry of Civil Affairs, an estimated 120 million people annually mourn the deceased at graveyards or memorial parks on Qingming Festival . In 2008, the central government declared the festival, that usually falls on April 5, a public holiday.